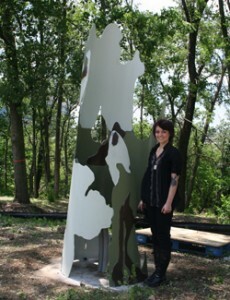 Artist Mallory McClellan with her sculpture, Sycamore. Been hankering to make picnic food? Had an itch to see some new public art? Well we’ve got a deal for you! The Harrison West Society and the Columbus Public Art Program will host a potluck to kick off community voting for a new, $90,000 sculpture in Harrison Park. Zeno’s and Katalina’s will donate pizza and pancake balls to the event, and neighbors are encouraged to bring a dish to share. Administered by the city, a call for artists was issued in November 2014. Ohio artists were invited to submit examples of their past work, and more than 20 artists responded. 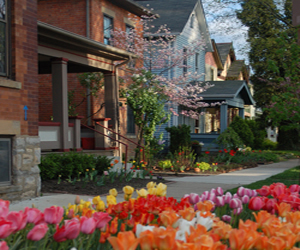 Their submissions were reviewed by an art advisory panel consisting of neighborhood representatives, nonparticipating artists, a design professional, a member of the Columbus Art Commission and a nonvoting advisory representative from the Recreation and Parks Department. The panel was charged with recommending three artists to create site-specific public-art proposals for the park. The qualifications of the artist finalists were then submitted to the Columbus Art Commission (CAC) for review and approval. The CAC has code-required approval authority over any art placed on city property or in the public right of way. The three finalists—Jon Barlow Hudson, Todd Kime, and Xan Palay—will be on hand to present their proposals and explain their visions for a work of public art in Harrison Park. After the presentations, attendees will be able to talk with the artists, vote for their favorite proposal, enjoy treats and mingle with their neighbors. Voting will continue online through August 7 on a website to be launched on July 25. Voters will be able to watch recordings of the artists’ proposals online as well, so keep an eye on harrisonwest.org for the address voting website. The proposal with the most votes will be announced on the Harrison West and city of Columbus websites in mid-August, after which, the proposal will be submitted to the CAC for conceptual approval. Once this approval is secured, the Department of Development will enter into contract with the artist and determine a timetable for completion. The goal will be to have the final sculpture installed in summer 2016. Please plan to join us on July 25, 2015 from 6 until 9 p.m. in the Harrison Park Condos Community Center, 575 West First Avenue to vote and nosh and mingle and celebrate this exciting step forward for Harrison West. This Year, July Ends with a Bang!